I've created a mock portfolio to track the progress of the Peak Oil Proof Portfolio. For the past week, the portfolio has gained 2.95%, while the S&P500 gained 2.10% - mostly due to poor US unemployment figures raising expectations that the Fed will issue a second round of quantitative easing. In the event of "QE2", we could expect that US energy demand will increase, buoyed by more readily-available money. Loose US monetary policy should generally benefit the entire portfolio. Today I'd like to spotlight one of the five country/region ETFs that I recommended for the Peak Oil Proof Portfolio: the iShares MSCI Brazil Index - EWZ. Brazil is currently the world's 12th largest producer of oil, but due to large offshore oil discoveries, it is poised to become one of the world's largest oil exporters over the next decade. The Tupi field, discovered in 2006, was the largest oil discovery discovery of the preceding 20 years. In 2008, within the same Santos Basin, two additional fields were discovered - the Jupiter field, which could equal the size of the Tupi field, and the Carioca field, which could potentially dwarf the other two fields as the world's third largest oil field. Producing oil from these fields will not be easy, or cheap - they lie under more than 6,000 feet of water and an additional 16,000 feet of rock. But with rising future oil prices, Brazil is well positioned to take in substantial revenue from oil exports. One interesting side note is that Petrobras CEO José Sergio Gabrielli has been publicly stating, based on the data available to the Brazilian oil giant, that the world has reached peak oil in 2010. The fact that the top oil executive of the country is actively discussing the issue is a good sign that the country is working hard to mitigate the effects and profit from the future decline in worldwide conventional oil production. In addition to their oil, Brazil is currently the world's largest exporter of ethanol and half of all the cars in Brazil run on sugar-cane-derived ethanol rather than gasoline. Because of their large oil and ethanol production, Brazil is one of only a handful of countries in the world that are completely energy independent for liquid transportation fuels. But being energy independent today doesn't mean that Brazil is resting on its laurels. In the past decade, the country has embarked on an ambitious plan to greatly expand their renewable energy production. The country already gets 80% of its electricity from hydroelectric dams, but they are currently working to boost this level by an additional 60% over the next 8 years through the use of advanced, environmentally friendly hydroelectric dams. The country has also been rapidly increasing its wind power production, from 29 MW in 2005 to 1,440 MW today. The current plan is to generate 2,333 MW by 2012 and 19,400 MW from wind power by 2020 - or about 20% of Brazil's total 2010 electricity generation capacity. Solar power currently makes up less than 15 MW of electricity production (mostly for rural villages) and, due to its cost-uncompetitiveness, is likely to take a backseat to hydroelectric dams and wind turbines in Brazil's future renewable energy mix. Brazil has the largest economy in South America and the 8th largest economy in the world - set to surpass Italy next year as the 7th largest world economy. The service sector accounts for 2/3 of the total economy, with banking making up a large part. Brazil is host to the world's third largest stock exchange - the Brazilian Securities, Commodities and Futures Exchange - and is a major banking center for Latin America. The industrial sector of Brazil is the extremely strong, with good growth in manufacturing, mining and construction. People who travel frequently on short-haul flights may be surprised that the Embraer airplane they're on is manufactured in Brazil. Brazil is also a major manufacturer of automobiles for the South American market - with Ford, GM, Fiat and Volkswagen factories producing more than 2 million cars per year. The country is also a mining powerhouse, particularly for industrial metals such as iron ore and bauxite. Because of China's insatiable demand for industrial inputs, Brazil receives more export revenue from China than from any other nation. Brazil has a number of favorable demographics which will contribute to economic growth over the next few decades. The country has a huge population bulge in the 15-35 year old age group, but its birthrate has halved from 4 to 2 over the past 30 years - providing a large workforce with declining social spending liabilities. Long known for its infamous "favelas", Brazil ranks only slightly better than South Africa on income inequality, but poverty levels have been decreasing over the last 10 years, with its gini coefficient falling from 0.6 in 2001 to .55 in 2008, while gini coefficients in the rest of the world (China, US) have been increasing rapidly. Brazil's service sector is vulnerable to a peak-oil-induced tourism decline. Tourism currently accounts for 2.8% of Brazil's GDP but 6.4% of Brazil's employment. Because of its geographic location, thousands of miles from most developed countries, tourism could potentially fall off as the number of long-haul flights are reduced as oil prices rise. However, total tourist arrivals in 2008, during high oil prices, were about equal to arrivals in 2007, so it remains to be seen what affect sustained high oil prices may have on Brazil's tourism sector. It's possible that the rising Brazilian middle class will take up any slack produced by a decline in foreign visitors. Household incomes are increasing rapidly and a growing middle class is emerging, which will provide a large domestic demand base for future demand. Embraer, the Brazilian commercial aircraft manufacturer, also has a high exposure to peak-oil risk, but the ETF holds only has 0.6% invested in the company. Brazil is the only BRIC country without nuclear weapons and has much friendlier relations with its neighbors than India does with Pakistan or China does with Taiwan. This reduced political liability also makes Brazil a particularly good place to invest. 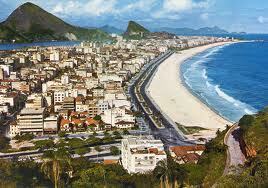 In short, Brazil has all of the favorable attributes needed for a high-growth, peak-oil-proof economy. The main threat I see to investing in Brazil is the possibility of their socialist-leaning government nationalizing industries, particularly the oil industry. It's for this reason that you should balance your portfolio across a number of countries and investment categories.